Hey guys!! 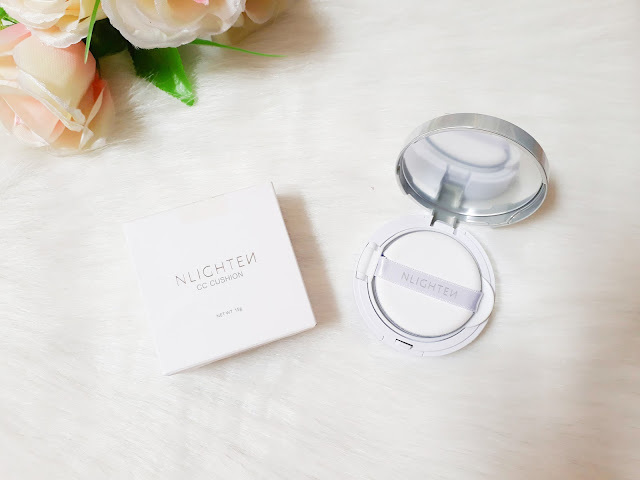 You probably have seen my feature about NLighten cosmetics and skincare last month, and today, I'm going to share my thoughts about one of the products on my kit: The NLighten CC Cushion. The NLighten CC (Color Control) Cushion is a revolutionary air cushion technology. 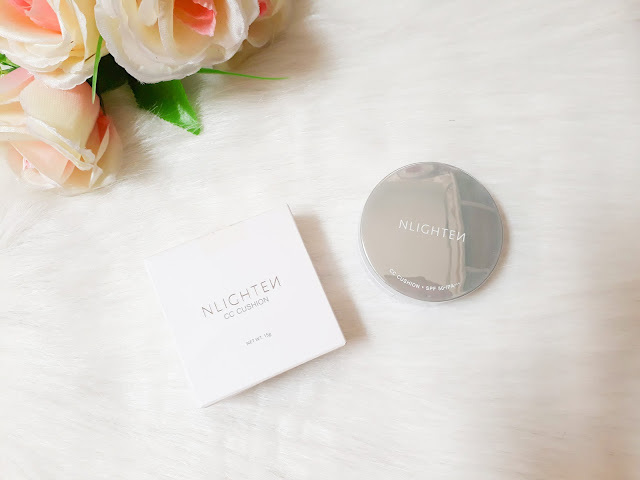 This lightweight base make up helps achieve flawless coverage and specially formulated to perform several functions such as to help lighten the skin, help prevent the signs of aging, and serve as sun protection against harmful UVA and UVB rays through its broad spectrum SPF 50 / PA+++. NLighten CC Cushion helps obtain a nourished skin with its superior anti-oxidant and hydration contents and ensures a luminous finish by filling the micro lines efficiently. 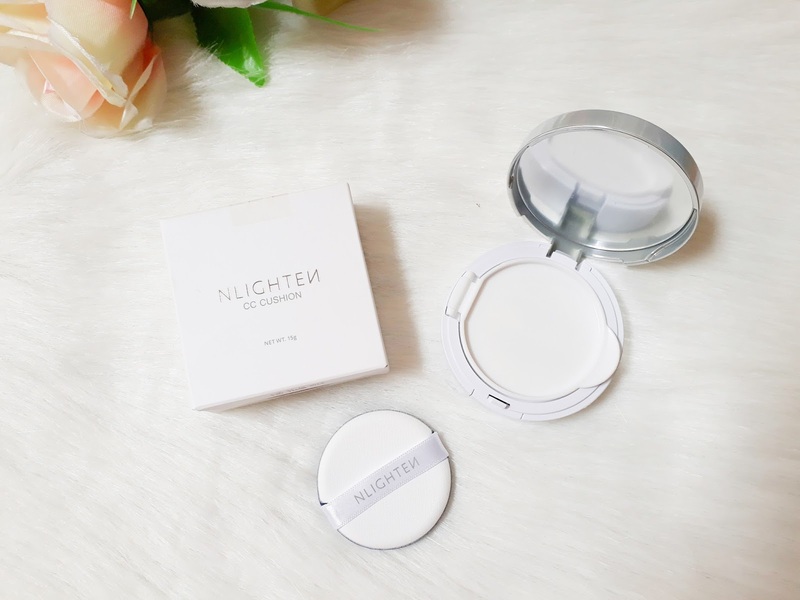 The NLighten CC Cushion comes in a white clean box with the elegant compact inside. It is a bit bulky to bring every day. 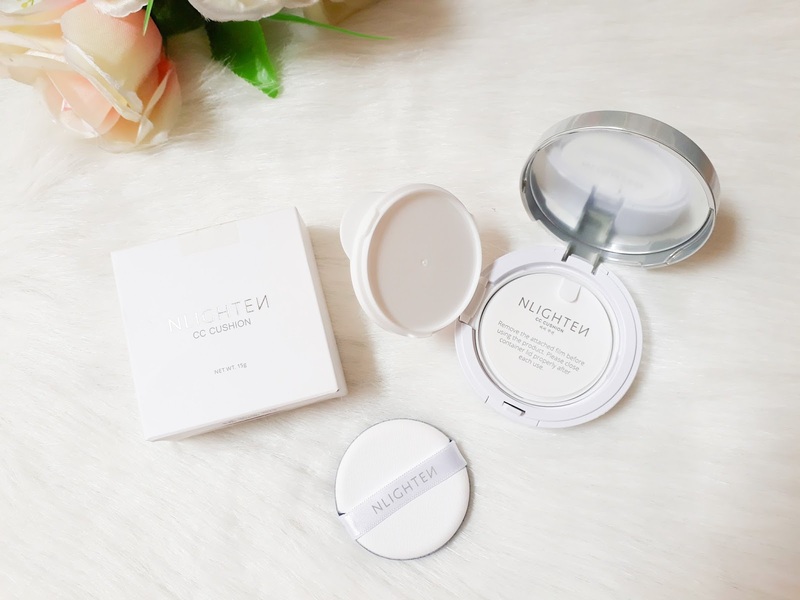 Opening the compact, it will display this cushion puff with NLighten print. The mirror is not clear and I find it useless. The puff is not stiff. I was surprised that for the first time, a foundation puff is very soft that you wouldn't resist touching it. Coverage is light to medium. It doesn't totally conceal imperfections and blemishes, but does a bit of magic. The NLighten CC cushion comes in one shade. At first, I find it hard to understand how can this product be good for everyone. But to my surprise, it does its own blending. 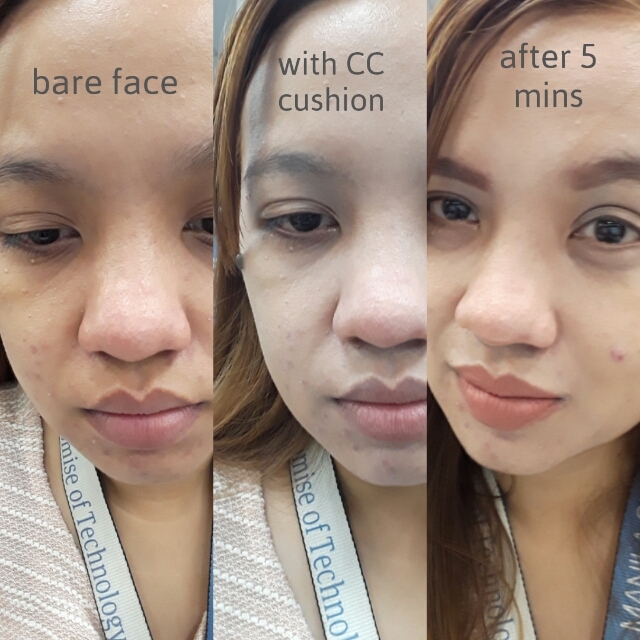 My photo below shows my bare face, my face when I applied the CC cushion, and what it looks like after 5 mins. Of course I did my brows and lips. I was supposed to put powder on because the shade is too light for me. But when I looked in the mirror, WHOA! It immediately sit on my skin. But I was a bit disappointed that it cannot cover my pimples. Lol. I still therefore agree that this CC cushion is amazing! 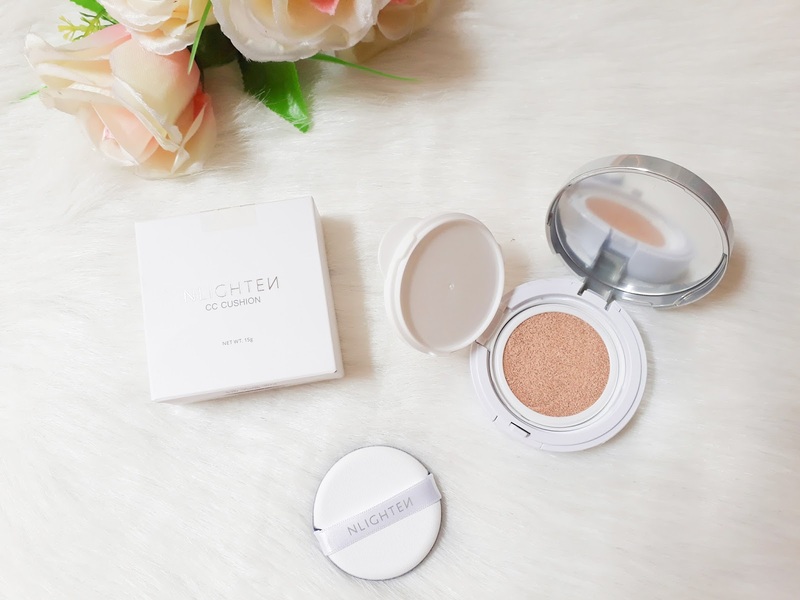 The NLighten CC cushion has SPF 50 to protect the skin from the sun. This one is a plus. As for the staying power, no retouch until I get off work. I started work at 6am and when I went home after an overtime by 5pm, my face still feels soft and I still look like I just applied foundation. Unfortunately for me, it's not a matte finish CC cushion, but a bit dewy. I'm happy that it didn't cause oiliness after. Ang ganda! Perfect para sa kagaya ko na on the go and to the rush ang peg.yun nga lang,medyo pricey at di kakayanin ng budget na gaya kong may 3 anak.